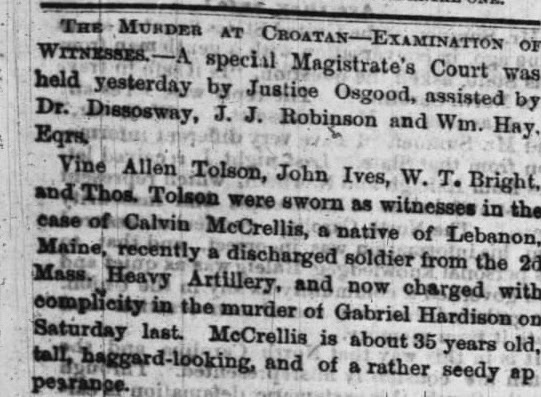 So after having a lovely beach day with the family, I decided to be random and just start doing some searches through some old newspapers from New Bern, NC. My 3rd great grandfather Mortimer Mitchell popped into my head and so I entered the simplest search criteria of his name and North Carolina and I came across some interesting information. This information adds another layer to the story of how Mortimer Mitchell came by his land. Let me set this up. Back in December 2011, I wrote a post called A Tragedy For One...Leads To An Opportunity For Another. 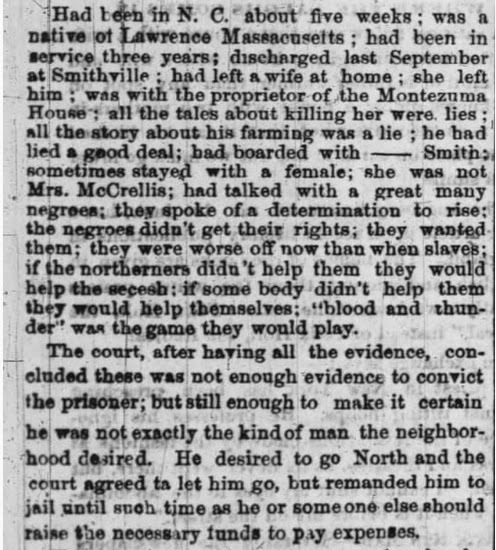 That blog post gave some background on the sad circumstances surrounding the land Mortimer Mitchell eventually purchased from a woman named Elizabeth Williams in Riverdale, NC. In that post, I shared portions of an article I had found on-line that was transcribed by a Gloria Smith Taylor. 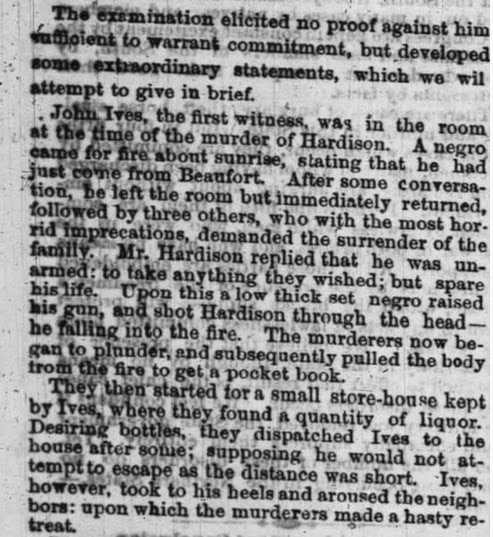 The article was from the newspaper New Bern Weekly Journal Commerce dated December 18, 1866. 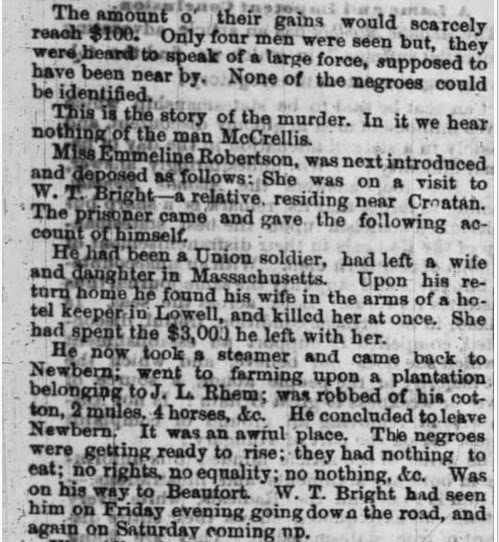 Well I believe I came across the entire article but I believe it was from the December 25th, 1866 issue. Images from Newbern Weekly Journal of Commerce, December 25, 1866, Page 1. 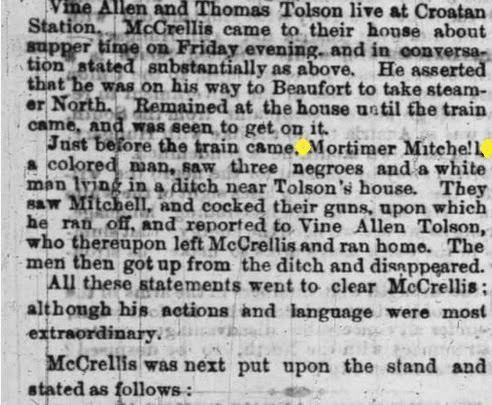 Just before the train came Mortimer Mitchell, a colored man, saw three negroes and a white man lying in a ditch near Tolson's house. They saw Mitchell and they cocked their guns, upon which he ran off, and reported to Vine Allen Tolson , who thereupon left McCrellis and ran home. The men then got up from the ditch and disappeared. Elizabeth Hardison Williams who sold the land to my 3rd great grandfather was born Elizabeth Tolson. I have done some cursory research on the Tolsons and it appears that she was the niece of Vine Allen Tolson. I still have to follow up on this. I am waiting for a book called The Heritage of Craven County, North Carolina to arrive in the mail to confirm the relationship. Anyway, it looks like Mortimer knew something was up and did the right thing and notified his neighbor. This reminded me that Mortimer Mitchell was a part of this Riverdale community and not just some ancestor floating around in isolation. 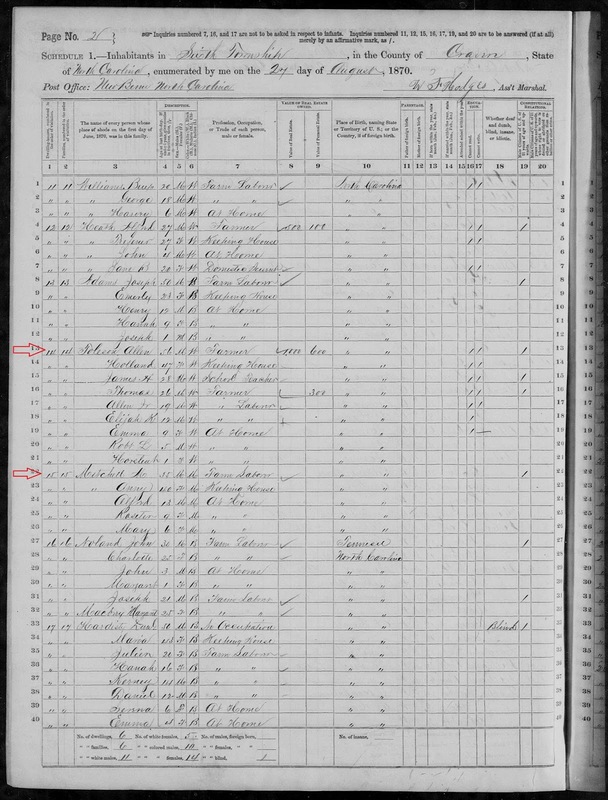 Take a look at this page from the 1870 Federal Census which shows the household for Mortimer Mitchell. Source Information: Ancestry.com. 1870 United States Federal Census [database on-line]. Provo, UT, USA: Ancestry.com Operations, Inc., 2009. 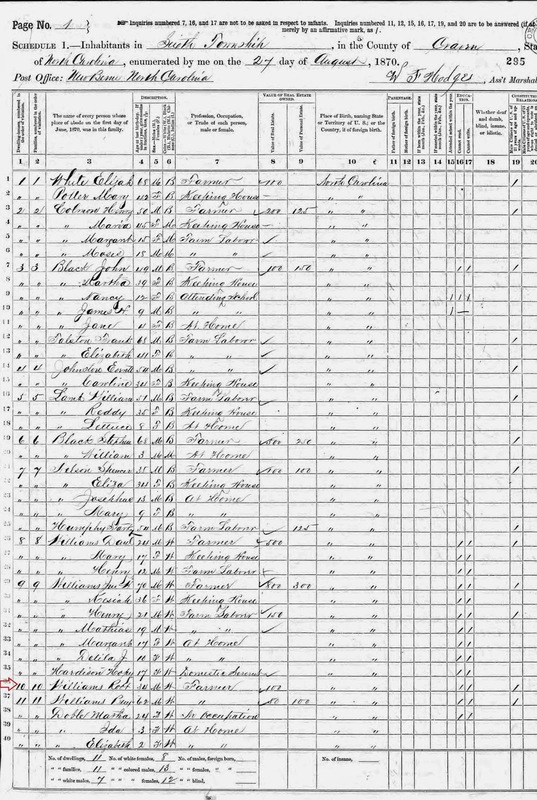 Images reproduced by FamilySearch.Source Citation: Year: 1870; Census Place: Township 6, Craven, North Carolina; Roll: M593_1132; Page: 295B; Image: 42; Family History Library Film: 552631. Source Information: 1870 United States Federal Census [database on-line]. Provo, UT, USA: Ancestry.com Operations, Inc., 2009. Images reproduced by FamilySearch. This is the page prior to the last census page. On it I have placed an arrow marking where Robert Williams was enumerated. He would go on to marry Elizabeth Tolson Hardison less than two years later on February 15, 1872. 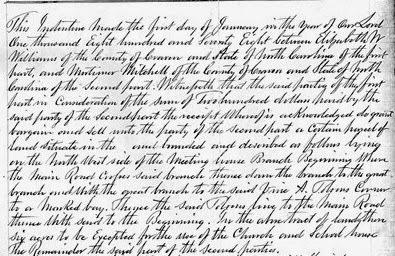 Now when I look at my 3rd great grandfather's deed things are so much clearer on how and why Mortimer came by this land and how he was connected to this community. Here's a portion of Mortimer Mitchell's deed.